I re-read the first volume of Batman Eternal with the benefit of now having read more of the Bat-titles that lead into it, and also digesting that massive 400-plus volume a little slower. With that, I liked it better than I did before, and that carried over to my enjoyment of Batman Eternal Vol. 2. Also, two volumes in, I have a better perspective now on the series's distinct three-act structure, and that helped temper my expectations more toward the story that Batman Eternal is telling. 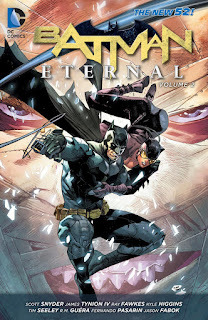 It remains that there's a certain amount of treading water that Batman Eternal is still doing, even so far as the thirty-fourth issue of this series. That's problematic, but at the same time the story offers a great amount of fan-service, with a Gotham-inspired story in the last volume and equally bringing a favored villain into the post-Flashpoint era with this volume. Aspects of this second volume are moving, suspenseful, and clever; even if Batman Eternal treads water, overall this book kept me entertained. Two main storylines drive Batman Eternal Vol. 2: Batman's battle with Hush, and his training of Julia Pennyworth, Alfred's daughter, as his "Penny-Two." Batman Eternal couldn't hope to be Jeph Loeb and Jim Lee's Hush, reducing Hush as it does to essentially just another scheming supervillain; however, Hush has always had great visuals, and especially as rendered by Jason Fabok toward the end of the book, Eternal becomes a better Hush story as it goes. At the same time, Hush's plan here -- as crafted by the writers -- is simply brilliant, blowing up Batman's weapons caches all around the city, causing great destruction. These remote caches have been a facet of the Bat-mythos at least since Knightfall or No Man's Land, and in all that time (and occasional rampant destruction), no other creative team has considered the implications of great collections of explosives buried under a major metropolitan city. Despite the failings of this volume's Hush origins, Hush's scheme is unique to him -- utilizing his knowledge of both Batman and Bruce Wayne to attack both at once -- and demonstrates a great use of the villain by the writers. Among Batman Eternal's raisons d'etre is to celebrate Batman's 75th anniversary, but equally, just before Convergence, Batman Eternal could be seen as a culmination of four years of New 52 Bat-stories. At least one storyline involves Louis "Bone" Ferryman, from way back in Judd Winick's Catwoman Vol. 1: The Game, making a deal for information from Jade McKillen, part of the gang family from the recent Batman and Robin Vol. 5: The Big Burn. There's more than a little here too from Ann Nocenti's Catwoman, as regards the Gotham Underground, and also the various gangland activities from John Layman's Detective Comics. None of these books are required reading for Batman Eternal necessarily, but I felt much more oriented in the book once I was familiar with the characters, and also I was better able to appreciate what a large tapestry the story is weaved from. At the end of Batman Eternal Vol. 1, the writers revealed that after twenty-some issues, Batman's battle against Carmine Falcone is just a feint by the book's real villain (and as such, those twenty issues aren't wholly "necessary"). Knowing as I do who the actual culprit is, and that it isn't Hush, I sensed Vol. 2 would end the same way and then wasn't disappointed when it did. It's certainly useful to think of Eternal three separate stories, each of which offer a conflict between Batman and a different notable villain (and each possibly representing a different Batman era), than one long story. The arcs certainly connect one to the next, but considering them separately helps assuage the sense that what transpires in Vols. 1 and 2 doesn't actually "matter." Like the previous volume, Batman Eternal Vol. 2 is wonderfully massive, a nice long reading experience, though it bows occasionally under its own weight -- the artists can't decide if Leslie Thompkins is young or old, and R.M. Guera's Alfred is significantly off-model; there's still the matter of Joker's Daughter holding Batwing Luke Fox's decapitated head in the first volume, even though Luke is mostly whole and hearty here. But by and large this second volume effectively tells the story of one very bad night in Gotham with good work by all involved (artist Fernando Pasarin also deserves mention for the gripping "Arkham disaster site" scenes). I've a much better impression of Batman Eternal now, and I'm looking forward to the conclusion. I think it was around this time when Eternal really started dragging its feet. The writing was inconsistent, and felt like filler at times. The subplots were poorly managed, with some feeling pointless (Batwing being buried under Arkham Asylum for who knows how long) or cringe-inducing (Jason Todd moping around like a middle schooler with his crush on Batgirl). Definitely Eternal has dragged at times, though I actually thought the second volume picked up a bit. In the first volume, there were a bunch of too-long threads with the Bat-family overseas chasing this or that red herring lead; at least in Vol. 2 the focus was mostly on Batman and his specific efforts to quell the riots and deal with the Arkham disaster.